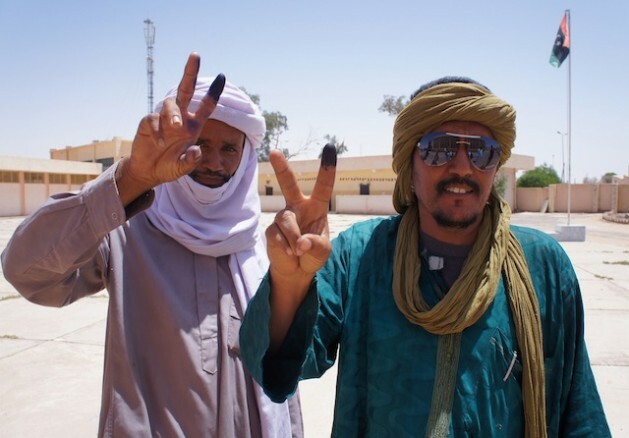 Voters in Sabha want peace in a new Libya. Credit: Rebecca Murray/IPS. SABHA, Libya, Jul 12 2012 (IPS) - On election day long lines of people from Sabha’s impoverished community of Tayuri waited to vote under the harsh Saharan sun. Four hundred miles from the Mediterranean coast, Sabha is tucked into the volatile southwest bordering Algeria, Niger and Chad. Tayuri’s non-Arab Tabu and Tuareg excitedly voiced hope to validate their Libyan status, and live a better life. Systematically discriminated against by the Gaddafi regime which promoted an ‘Arabisation’ campaign in Libya, the majority of voters interviewed by IPS said Mahmoud Jibril’s winning liberal National Forces Alliance (NFA) party best represented their interests. Voting began last weekend and was only completed Wednesday. In a last minute controversial twist to appease Libya’s east, the National Transitional Council (NTC) stripped the new National Congress’s power to appoint a 60-member constitutional committee proportionally from each of Libya’s three regions. Instead they say Libyans will vote for the committee members directly. Of the 90,000 Libyans registered in the sixth electoral district of Sabha and Al Shati, nearly half are female. The area’s total population is an estimated 150,000, with seats allotted for seven independent candidates and nine political parties. Libya’s total population is an estimated six million – most residing along the coast – with 2.8 million registered voters nationwide. The country’s vast southern desert swathe – with Sabha to the west and Kufra’s oasis in the east – is where Gaddafi’s ambitious ‘man-made river project’ pipes underground water to the thirsty, populous north. It is also home to huge oil reserves, rare minerals, and lucrative cross-border trafficking of weapons, gasoline and goods out of Libya, and drugs, alcohol, and sub-Saharan migrants into the country. Libya’s long, porous border has attracted the attention of Europe and the United States’ African military command, AFRICOM, which hopes to prevent migrants reaching European shores, and stop the spread of Al Qaeda in the U.S.-led ‘war on terror’. Yet many Sabha residents complain that the NTC in Tripoli has largely neglected their tattered city and southern borders, with loud Federalist proponents from Benghazi dominating Libya’s media landscape and political discourse. Once a hub for international tourists venturing into the Sahara, Sabha’s shabby housing estates, destroyed hotels and piles of garbage are a picture of neglect. Hundreds of sub-Saharan Africans rest in groups on broken sidewalks after an arduous desert trek into Libya. Gun battles are heard at night, and security, jobs, health and education are the priorities here. Fada Hassan, 25, dressed in a colorful abaya, sleepily mans a rudimentary kiosk filled with tinned goods in the Tayuri neighbourhood. She is Tabu; a traditionally semi-nomadic, darker-skinned indigenous tribe with ties to southern Libya, Sudan, Chad and Niger. The Tabu endured decades of harsh discrimination under the Gaddafi regime, especially during Libya’s losing war for Chadian territory in the 1980s. According to a United Nations Human Rights Council report in July 2010, the government revoked many Tabu citizenships in 2007. This has exacerbated confusion over which of the Tabu are from Libya, and who is ‘foreign’, and contributed to the delay of Kufra’s Tabu vote, which was completed Wednesday. The Tabu were one of the first to join the revolution against the Gaddafi regime last year, utilising their desert networks to block the southern borders against sub-Saharan mercenaries aiding the loyalists. Fada’s husband Othman Suleiman is Tuareg. Nomadic pastoralists who also live in Algeria, Niger and Mali, the Tuareg too are marginalised, with generations born in Libya discounted by the government. Gaddafi often deployed the Tuareg as fighters, including during the revolution, by promising citizenship documents in return. Last year Fada and Othman fled to the south from Benghazi, fearing revolutionaries who suspected most black people of being Gaddafi loyalists or mercenaries. Tayuri’s estimated 15,000 families live in illegal, ramshackle houses. Rubbish lines the unpaved roads, pipes lead to makeshift water wells, and sewage is stored in septic tanks. The area’s dilapidated school holds 50 students to a class, and the clinic was converted from a livestock barn. There are scant jobs for residents besides the illicit jobs in cross-border trade. Without identification, residents are denied access to free education and healthcare, legal housing and formal jobs. They are unable to move through checkpoints. Ironically, Tabu and Tuareg live peacefully together in Tayuri although many fought on opposing sides of the revolution. In late March, during ferocious clashes between Tabu and the Arab tribe, Abu Seif over a payment dispute, heavy weapons leveled houses in the poverty-stricken Tabu neighbourhood of Hajara. Only when Prime Minister Abdurrahim El-Keib and the national military leadership visited did an uneasy ceasefire take hold. In total 147 people were killed, with an estimated 400 injured from the fighting. Popular independent candidate Abdul Ghader Swilhi explains. “First we didn’t know what was happening. There was a dispute over money and some Tabu were killed. But the Tabu made a mistake and attacked the airport, the hospital and the army headquarters. So we all came out to defend the city. When we realised it was about money, and not about the Tabu taking over Sabha, we withdrew.